I loved the line in this post: “It feels good to check “college graduate” off my list of Important Life Accomplishments, but I got something far more important out of college than a degree. Thank you so much for the lovely comment and the congratulations! Isn’t it amazing how things fall into place after discovering Asperger’s and all of it’s complexities? That’s what I thought I would do (that’s what I thought might work for me, work-wise) but not very successfully. Just out of curiosity: what type of work do/did you do as self-employed, and how did you start up? Being self-employed can be really tough. I was fortunate to marry into my first self-employed job, which was a martial arts school that my husband had started shortly before we married. We grew it together – he taught the adults and I started up classes for little kids. I guess that sounds like aspie hell, but was a lot of fun for me. I understand four-year-olds much better than I understand adults. While we still had the school, I started a publishing business on the side, on a shoestring, and slowly grew it over the years until that became my main job. There were a lot of ups and downs over the years, but I suspect that having a job where I had to work for someone else would have been much more difficult than the tough road that being self-employed has been. Wow… it sounds quite exciting actually. I think it is extremely maturing to be your own boss (have had a bit of a taste of it), it is very much like being thrown into the deep end and just have to start swimming. I automatically switch my professional-voice on now when I pick up the phone in case it has something to do with me representing myself as a freelancer/sole trader or as a company owner (the company is dormant, but tax departments e.t.c still occasionally call and I want to sound professional). Ps. Just curious: what type of martial arts? I mostly did taekwondo along with a little hapkido and some weapons arts. OK. I’ve never heard about Hapkido before, I like Taekwomdo from the look of it. I have done Judo in the past, and it was great fun – I liked it a lot actually. I eventually decided to stop because I didn’t make much progress (if any) so I thought it began to be embarrassing to have done it for quite some time and pretty much remain at beginner’s level. This is such a familiar story. I’m currently in college, and while I learned about Asperger’s in high school and thought I may have it, it became blatantly obvious in college. There wasn’t as much free time in high school, so I didn’t have to socialize between classes, no lack of routine, just constant classes until we took the bus home. With all the free time at college, I was completely lost. I had no idea what to do with myself (still don’t), and I didn’t realize that other people socialized so much. Congrats on your degree by the way. Oh! When you mentioned your teachers calling on you because you make a certain face, that happens constantly with my two favorite English teachers, they know from my face, I have something to say even if I don’t raise my hand. I’m currently working on a degree in biology and English. You make a great point about college being so much less structured than high school. I had a long gap between the two so my experience was admittedly different, but I faced a lot of the same hurdles with the amount of socializing expected. I am awaiting the results of an neuropsychological assessment performed on my 16-year-old daughter to confirm AS. Other than a passing mention from a grade school teacher years ago (“has anyone ever brought up Asperger’s?”), none of the professionals we sought out over the years to diagnose our daughter’s difficulties even mentioned Asperger’s. It’s both a relief and scary to finally be on the right track. I stumbled upon your blog yesterday and started reading it from the beginning. A thousand thank yous for a such a wonderfully-written, insightful and informative site! I’ve passed the link along to my daughter and am so hoping she reads it. I know as my reading progresses I’ll be able to understand and guide her much better during her transition from high school senior to college freshman and beyond. Please keep writing! You have a gift! Girls very often escape diagnosis, because females can have “atypical” presentations of AS. I put atypical in quotes there because the original models of autism were based mostly on males and fail to account for some of the traits commonly seen in girls but less commonly seen in boys. It *is* a bit (read: very) disappointing to realize I will probably never feel things the way other people feel them; in fact, my most intense emotions have always been while watching/reading fiction or roleplaying–that is, adopting a fictional persona. It’s almost like I can have certain emotions, but only if I assign them to someone who’s not me but whom I ‘know’ through imaginatively analyzing, fleshing out, and empathizing with them and can then attempt to imitate. This gets tricky when the cognitive dissonance finally kicks in, informing me that, no, I am not actually the Tenth Doctor or a straight male–or even necessarily a queer woman–or what-have-you. Actually, typing that out, disappointing really doesn’t do it justice! I’ve thought I could develop a strong sense of self and my ‘own’ emotional range by distancing myself from fiction and roleplaying. It sounds like fiction and roleplaying, even if it’s only ‘roleplaying,’ say, a straight NT woman, is the best I may ever get. That’s rough, and makes me wonder if I’ll always bash up against that point of cognitive dissonance where a role I play eventually fails me and I end up back at square one, staring at the hole that seems to exist where my sense of self should be. The hard part about recognising and analysing our own emotions and feelings, I believe, is that the instruments that have been handed to us for doing so are all NT based. That’s why “roleplaying” is easier, because then you can draw on all the things you’ve read and heard to construct how you SHOULD be feeling. It’s a cognitive exercise. Determining how we actually feel… we lack the vocabulary for that. Because the vocabulary is inherently NT, given to us by our NT parents, peers, and fictional characters (like TV shows and books). My parents probably aren’t NT, but they too lack the vocabulary, so emotions weren’t really discussed when I was growing up. That doesn’t mean I don’t feel them, I just lack the instruments to label them, same as my parents. Hm, that may be a good way of thinking about it. I certainly feel, but most of my ‘social’ feelings involve either needing to be closer/reassured/accepted (which I associate with being childish) or needing to disclose emotion (sorrow and fear, often, which I hide because I get tired of feeling overwhelming and hyper-dramatic to people and hurting them emotionally). Often I’m just ashamed of how hard things are for me and how hard it is to get out of my own head. Living in a situation where I wouldn’t have to be ashamed of that, feel embarrassed and incompetent if I articulated it, or concerned about my survival if I act like I ‘naturally’ act is something I can’t even imagine. I’d likely cry for a few weeks out of relief 😉 And then sleep for a month. Oh my gosh, yes. My excitement is very uneven. Like, today I was over the moon about something that I more or less knew was going to happen for months but it finally became “official” and I was infinitely more excited than when I first heard it was likely to happen. 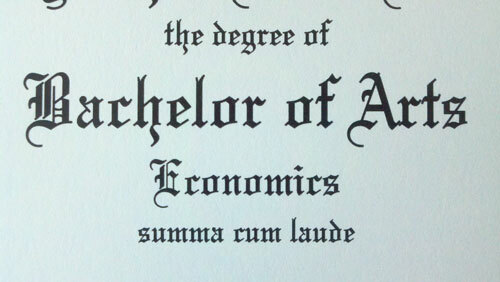 The day I got my diploma, my reaction was kind of like “oh, that’s nice” and today I have no idea where it is. It’s not hanging on my wall, because it’s not the kind of thing that excites me. In fact, I think my husband was way more excited about the diploma than I was. The way you talk about roleplaying reminds me of the way I think about writing fiction. I can inhabit all sorts of complex emotional states through fiction that I can’t access in real life, like romance or grief. If I put myself into the role of a character, it’s like I don’t have to directly experience that thing so I can. I’ve given up expecting to experience those things in the way that others do and content myself with the occasional forays into fiction. I hadn’t thought about it that way, but that makes perfect sense to me. In roleplaying (I used to do it via writing, all online), I could be sitting in a quiet room in front of a computer, with plenty of time to think about each response to my partner and to think myself into the character’s experience and react to whatever my partner threw at me without worrying (too much) about what might be expected of me or being distracted by all the other options and stimuli that experiencing whatever I was writing about would bring in real life. There’s extreme filter and control. And roleplaying (at least the way I did it) was all about exploring heightened emotional states, *especially* love and grief. Though even when working in words, I still felt some boundaries that I don’t sense in others; I had difficulty even making characters or plot take truly demonstrative, impulsive actions. If a building blows up in a narrative I’m writing or a character’s expected to react to pain, for instance, you can bet I wrote about it in a much more indirect fashion than I’d like to have been able to. I don’t know if you write about this in other entries, or if it’s alright to ask, but how did you go about giving up on feeling like other people seem to feel? I’ve spent most of my life thinking that if I just changed in x, y, and z ways, I would finally be rewarded with the things other people seem to have had since they were teenagers: desire, passion, the ability to (fairly) easily distinguish friendship from love and to pursue both, a sense of adventure, a firm sense of internal wholeness, a lack of constant low-grade fear. The more I read (not just here, but elsewhere as well) the more it seems like the sense of having my emotional potential strangled by fear and thoughts and this constant sense of feeling not quite ‘real,’ not quite having a core to feel from with confidence, is not something that can be ‘fixed,’ but instead a way of being. I’m not sure how I can adjust to thinking it’s not just right there around the corner, if I’d just try harder, be braver, take more risks, etc. I’m not saying I don’t think I can feel (quite obviously not the case!) but–it does fit, to me, that I feel in a different way or register than others, and that I’ve always desired that other register, one that’s everywhere in life and in fiction. By “giving up,” I mean accepting. Accepting is going to be damned hard, I think. I think two things contributed to finally giving up on that hope that I’d suddenly be normal: age (I’m getting too old to care about a lot of stuff) and getting a diagnosis (or probably more precisely, discovering that I’m autistic). Acceptance is hard and it’s a process, so be patient with yourself. I say that a lot, but it’s so important. It took me a long time and thousands upon thousands of words here to come to where I am now and even then it’s a shaky place to be in sometimes. It helps tremendously to talk to others on the spectrum and see that there are people like us, who share common experiences. All of those “me too!” moments are a really important part of the process because they’re validating and they “normalize” experiences that we’ve always felt are outside the norm. I’m looking into the steps to explore diagnosis now. It’s unfortunate it seems to be so expensive, but there it is. I’ll definitely have to work on reminding myself that acceptance will take a while. I’m surprised how down I’m feeling right now. Tons of memories from my childhood are coming back as I read more about ASD, things that were painful at the time but that I’d shoved away as irrelevant, tendencies I thought I’d outgrown. Carrying around a baby blanket into first grade and liking to sniff it because it smelled like fabric softener; realizing that was weird one day and stuffing into my desk, mortified; having to carry a stuffed toy with me to get through 4th grade; sucking my thumb until late as a kid; never remembering a time I didn’t know how to read; realizing I’ve only had one friend at any time, that they were all fellow outcasts, and that I would hurt them emotionally, even physically, without feeling anything more than shame much later–really old stuff. And things about my siblings as children, too. Seeing how truly pervasive and defining it is makes me realize it’s all ‘still there’ and won’t ever go away. I honestly don’t know how to cope with that! I’ll have to find some way to stay motivated to work and socialize now that the dream of waking up ‘normal’ one day, truly able to connect to others and feel ‘real’ and included, isn’t possible. That my nervous system won’t physically let me do it. Definitely going to have to blog about this. Even going on at you, a complete stranger, who has her own issues and life to attend to, seems so ASD! Even having to blog about it because I can’t handle the thoughts otherwise. Diagnosis is very expensive, in many cases. If you take a look at my adult diagnosis series (linked from the top) one of the posts has some alternative lower cost options that may be a possibility. I spent weeks feeling like I was healing that scared little kid inside me. It perhaps helped that I’d already parented an actual child and so I could kind of take on a mothering role and distance myself from the memories a bit. Another thing that helped me was thinking of what I would say to me if I was someone else. I realized I would be a lot kinder and more compassionate to someone else having the same experience than I am to myself, which was shocking. It takes a lot of adjusting, but trust me when I say that the feelings you’re having right now will change in time. There’s a kind of mourning period that happens and it’s really hard, but it’s not forever. I’ll take a look at the diagnosis articles! Right now I’m in the process of switching from my old psychiatrist (one my mother chose for me when I was a teen and who’s technically a child/teen psychologist) to a new one, and doing the old ‘should I go with one who’s out of network and just pay the difference or stick to in network’ dance. As usual, I have a hard time judging whether my impulse (to just go with the out of network one my previous psych recommended, even though I didn’t really have a rapport with her) is based on ‘wow, it’s easier to do this than try to figure out a way to get possibly cheaper and comparable care’ and my tendency to stick to a first impulse even if it makes no sense or on actual legitimate reason. Finding new care is such an expensive time-consuming song and dance, alas. Revisiting that scared little kid is something else. I was scared and stressed all the time as a child (afraid people would ‘catch on’ and leave me) and still am, often, today. I’m also realizing how much things we always wrote off as my little sister being ‘stubborn’ (always gets the last word and wouldn’t let people tell her she’s wrong, talks all the time, used to say hateful things to my parents casually, had to have her socks turned inside out because of the seams, super-sensitive to smells…) were almost certainly spectrum-related. I got all of the attention, because I was the one who’d meltdown most spectacularly. She’s still struggling to find work and equilibrium (quit a job because she didn’t like it and was convinced everyone disliked her, though I honestly don’t think that was so; now caught in career-hunt-or-go-back-to-school limbo and slipping into depression), and would never be willing to consider ASD as a possibility; she hates it so much in my father. It hurts to watch her go in behavior loops that hurt her. Every moment comes with a new thing that suddenly makes more sense. I wear hiking boots to office work! Who does that? But I like the way they feel; there’s more pressure/support around my feet. It makes me feel more confident. I used to come to work with my hair still wet from the shower all the time because I didn’t like the way a hairdryer feels and it never occurred to me wet hair might not be kosher. Sigh. There’s a lot of work to do. So much of how I think now seems to have revolved around finding elaborate ways to justify my behavior as ‘normal’ or ‘reasonable’ so as to make me the one who’s right and avoid hurting my ego more. ETA: Didn’t really have a rapport with my old psych, that is. Haven’t met the one she recommended yet! Good luck with it and with working through these difficult early stages.